In which The Gay Recluse is graced by our most cantankerous correspondent, The Blind Architect. [A]s usual, any noteworthy thing you can find in Washington Heights has already been done to death in the real Manhattan a few miles to the south. 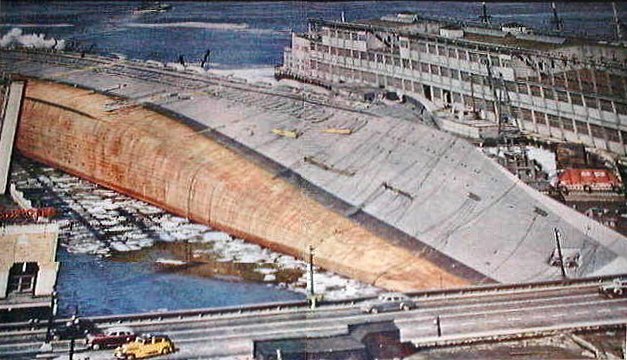 As a young man, before I lost my vision in a [redacted], I snapped this shot of the cruise liner Normandie (rechristened the USS Lafayette during WW2) lying capsized in the Hudson River piers in the mid-40’s (that’s streets, not years). Thanks for that expectedly cantankerous report, TBA! We won’t defend Washington Heights except to say that it continues to be a land of shipwrecks (albeit small and insignificant ones), in both literal and metaphorical senses of the word, without regard to the vagueries of the downtown shipwreck scene that you are obviously so well acquainted with. That said, we appreciate your candor and lookforward to hearing more soon!